AX shooting suspect Paul Anthony Ciancia, 23, who allegedly pulled a firearm out of his bag while approaching an LAX Terminal 3 security checkpoint and opened fire around 9:20 a.m.
A lone, black-clad gunman carrying a high-powered assault rifle shot and killed a TSA worker and injured others on Friday inside a busy terminal at Los Angeles International Airport. Violence erupted after Paul Anthony Ciancia, 23, pulled his firearm out of a bag while approaching an LAX Terminal 3 security checkpoint and opened fire about 9:20 a.m. 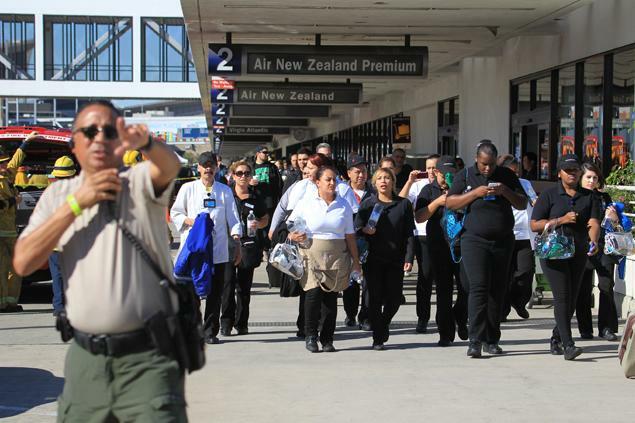 He was an L.A.-area resident who was originally from of Pennsville, N.J.
Ciancia was carrying a bag containing a hand-written note that said he “wanted to kill TSA and pigs,” said a law enforcement official who was briefed at LAX on the investigation and requested anonymity because was he was not authorized to speak publicly.